Occasionally it’s nice to go out and have lunch or an evening meal and on Sunday 6th September we had gone along to the Pia Bella sports field to enjoy the SOS Children’s Festival and take photographs in preparation for writing an article. It was yet another blistering hot day and after a while we decided we needed to retreat from the heat so we went along to a favourite restaurant Al Shaheen in Karakum knowing we could sit on the veranda under umbrellas and cool down with a nice cold drink. Being mid afternoon we decided to have lunch and ordered their very tasty cheese and broccoli soup and so nice was it, that we asked for more toast to help it on its way. Getting to grips with a monster Yorkshire. Soon our main course of Roast beef and trimmings arrived and Imtiaz and his waiters with lots of smiles presented me with a huge Yorkshire Pudding that was around 13cm across and about the same depth and so, so crunchy and as I slowly dissected it and ate it with the beautifully cooked beef in thick gravy with the vegetables, I was in a food heaven. Sad to say, after the soup with extra toast on a hot day I was being a bit adventurous and had to have a take away bag. Imtiaz told me that they will supply to order these monster yorkshire puddings if you ask for them when booking your table in advance and at no extra charge. How many of our readers may remember as a child having cold yorkshire pudding with jam on. It was a favourite treat prepared by my mother on a Sunday evening or on a Monday. 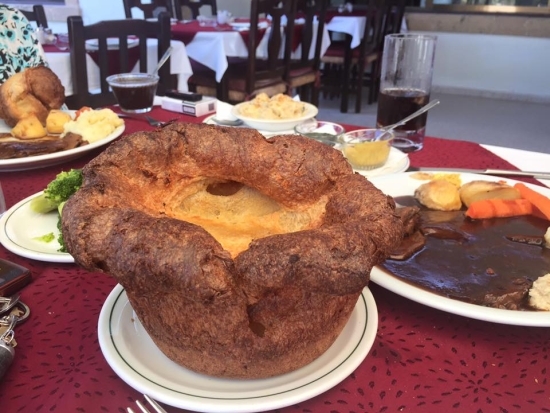 This entry was posted in Media reports, Special Events and tagged Al Shaheen Restaurant Karakum, Fine Dining, Sunday roast, Yorkshire pudding by kyreniacommentator. Bookmark the permalink.